But first, let’s back up a little bit. Towards the end of 2013 I decided that I wanted to push myself and run a half marathon. Up until that point, I had only run 5Ks and 10Ks. I downloaded a training plan from a running magazine, taped it next to my calendar, and then completed *most* of the runs on the plan. You see, my first half marathon was in mid-March of this year and training through the winter was difficult (and that’s putting it nicely) because of the bitter cold, ice and snow. Most days I had to train on the dread mill which is just…well you know how that goes. Race day came and went and I was very happy to finish in 2:32:54. I did have to stop around mile 10 due to some aches and pains so I went into run/walk mode for the rest of the race. After that my running wasn’t very consistent even though I had the Stratton Faxon Half Marathon in June. That race was horrible – I just don’t have words for how much I struggled during that race – knee and hip pain, GI issues, etc. Also it was just nothing but hills…lots of hills. Between not training that well, all the hills, those other issues and having to walk for a good portion of the race, I finished the race in 2:52:39. I was so disappointed and I honestly felt very defeated and wondered if I should continue trying to run half marathons. Enter my guardian angel, Fleet Feet Sports Stamford. Fleet Feet is an awesome running store located in Stamford. I’ve been a big fan of the store since they opened in 2013. The staff is incredibly friendly and knowledgeable. 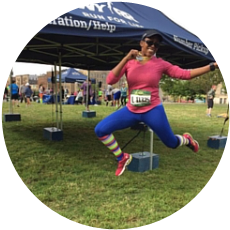 They support local races in Fairfield County, offer group fun runs (3-5 miles) three days a week and often host contests and giveaways. They also have training groups for 5K and 10K races. Since I have run many 5Ks and a few 10Ks, I felt comfortable with that distance so I didn’t feel that I needed a training group for those distances. This past summer, the store offered their first ever half-marathon training group. This could not have come at a better time! I went to the information session at the store and then signed up for the group when I got home. So how did this training group help me? Coached runs twice a week (Thursdays and Saturdays) and then 2 other runs done on your own was very doable for me. It held me accountable! Sure, there are days when I didn’t feel like running, but there is something about knowing 10-15 other people will be running as well. A few of our long runs were in the rain and really bad humidity. Suffering through those runs with other people made a difference! Thursday runs were for drills. Hills, Fartlek, 800m repeats, mile repeats, tempo..these were literally all foreign words to me. I had no clue what any of these drills meant or how they would help my running. Now I realize the importance of all of these drills! Coached long runs on Saturdays were so helpful because I got to run different routes through the city and learned more about nutrition and hydration for long runs. Also these long runs gave me more confidence. Knowledge is power! I felt comfortable asking our coaches and mentor any questions that came up as we were training. It felt good to have an expert to speak to. We were also given weekly handouts on different topics, a training plan (with drills outlined for each week) and routes for our runs. I know that I will use this information again when I train for half-marathons in the future. So what was the end result for me. I went from a PR of 2:32:54 to a PR of 2:15:46 (achieved this past weekend at the Diva’s Half Marathon). That’s a 17:08 improvement! Not only did my time improve but I also enjoy running again. I know I’ll never be the fastest running, but I can at least be a consistent runner – I will continue to strive for that. I would recommend a training group to anyone looking to improve their time, stamina and knowledge about running. The goal race for the training group was the Hartford Half Marathon taking place today! I didn’t sign up for this race since I just completed a half marathon this past Sunday, but I know that everyone will do great and have fun!! Have you ever tried a running training group? Let me know in the comments section! As always, you can connect with me on Instagram and Twitter.